Click here for my photos! Well folks, I had really good intentions when I left for the US Open Pickleball Championships in Naples, Florida last week. I had planned to write a couple of blogs to let you know how things were going, and to share a little bit of the excitement. But, the excitement got to me, and before I knew it, I hadn’t written a word and it was time to come home! Every night I returned to our rented house hot, sweaty, and exhausted. After a quick soak in the pool, it wasn’t long before I was in bed each night. So, I’m sorry for the delay, but let me try to describe what an incredible experience I just had! Well, I didn’t bring home a medal……… this time. In fact, I didn’t even come close. While I have to admit I had visions of wearing one of those beautiful medals around my neck, bringing home a medal would have been a bonus. It wasn’t to be. Maybe next year. When Claire and I arrived at the courts on Monday, we were surprised to be scheduled to play on the Zing Zang Championship Court! Zing Zang is a major sponsor. The championship court has a canopy structure over it, surrounded by sponsor boxes and bleachers. Since this was the age bracket competition, my first thought was…….”oh Lord, who are we being paired against! ?” It turned out to be two very nice opponents, one 4.0 and the other 4.5 level. We lost that match, and were immediately assigned to the same court for our second match, which we won. It was so exciting to play on that court! I have to add a huge thank you to the ten or twelve of you from Ohio, who came to watch us play on Monday! It was exciting to have a fan club rooting for us that early in the morning! Our third match was played on an outside court where we realized how sheltered we had been to the wind while playing on the stadium court. We lost that one to a very good 4.5 team. That’s the thing about the “age” division. You could play a 3.0 team or a 5.0 team. On Tuesday Leo and I played the mixed age only bracket (yes, he’s much younger). For those of you who don’t know Leonardo Gonzalez, he is my “pickleball husband.” I met him in England in 2014 and we have played several tournaments in the US and in Europe. I love this guy, and I love playing with him. He is an incredible world ambassador for pickleball, even if there’s no title for that. We will be playing together in the UK and in Finland next. Anyway, we won our first match against a 4.0 woman and 4.5 man but lost our next two matches to a 5.0 couple, followed by a 4.5 couple. We didn’t know what levels these teams were when we played them, but later in the evening I looked them up and it really put perspective on our games. We were simply out skilled, but felt we played well against these teams, despite losing. On Thursday, Claire and I played in the age/skill competition. We were so excited that we won our first match! It was the first match we had ever won at the 4.0 level! Yes…..I mean it! We had won a game or two, but never a whole match, and we won it in two games! We followed that up with a three game battle against friends of ours from N. Fort Myers, but lost in three games, and then lost the next match to end our day. In the mixed age/skill with Leo on Friday, we started out playing very poorly in our first match and lost. It was one of those matches that you hit mistake after mistake, and despite trying to use the time outs to regroup, it just doesn’t come together. You finish feeling like you just played two skill levels lower than what you are. This immediately dropped us into the losers bracket. We played better in our second match and won easily. We played even better in our third match, but after a hard fought game against a very good (and young) team, we lost 17-15. Had we started out playing like we did in our third match things could have been much different. That was one that got away. But that’s pickleball! So there you have it! No excuses. Some good play, some not so good. Lots of things to work on and plenty of reasons to try again next year! The tournament venue is in the East Naples Community Center park, where they have dedicated pickleball courts and courts lined on tennis courts with temporary nets. In total, there were 48 courts. USA flags lined the road leading up to the park. Volunteers were plenty, taking care of parking, directing players to where they needed to be, driving players in shuttle carts to and from distant courts and the overflow parking lot, acting as runners to get game score sheets to the tournament desk quickly, and doing anything necessary to make sure every need was taken care of in order to keep the tournament running smoothly. There were two huge tents with pickleball vendors selling everything from clothing to paddles, grips, nets, balls, gear bags, shoes, jewelry, pain relief products, and a lot more. There was a food and drink area, and in the afternoon there was always a live band or singer playing in the beer garden. On Friday, there was a free BBQ provided by a local restaurant and sponsor. A massage therapist was on hand everyday from 6am to 6pm, working for donations only! (He was good, and very busy). Temperatures were in the mid to high 90’s towards the end of the week. Water was always available and there was a misting tent you could sit in to cool down. Picnic tables and bleachers provided places to sit, and there were several large canopies to put your gear or rest in the shade. The tournament did a really nice job of mixing up the court assignments so that everyone (including the pro’s) played on all the different types of courts, including the covered Championship Court! Pickleballtournaments.com provided up to date results where you could watch for your court assignment or results on your phone or on TV monitors located throughout the venue. All games were announced via a speaker system, beckoning players to gather at the tournament desk and then directed to their assigned court. All this created a very organized, timely and well run event. Most days, towards the later afternoon, a group of us would gather in the athlete’s bleachers at the Championship court and watch some of the best pro matches. 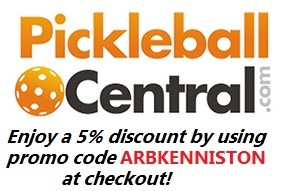 I would suggest that you go online to Pickleball Channel and subscribe to it. There, you can see video of some of the most incredible pickleball play, from short clips to entire matches. On Saturday, the last day, the 19-49 pro finals (Mixed, women’s, and men’s) were held on the Zing Zang Championship Court. Before the final match started, all the international athletes from thirteen countries (that was the last count I heard) paraded their country’s flags into and around the stadium to booming music (playing “Wave your Flag!”) What an emotional scene it was as those athletes far from home marched proudly around center court waving their flags back and forth, while everyone else danced in the stands. It was like a mini Olympics! I could go on, but I think you get the idea of how incredible this event was. It’s always disappointing to lose early, but sometimes that’s the way it is, and you just make the most of the opportunities that present themselves. This event did not disappoint. If you didn’t go this year, put it on your schedule for next year. Lastly, two energy charged Pro Finals will be broadcast on TV in May. Tune into CBS Sports Network on Friday May 19th at 8pm (EST) and then Friday May 26 at 8pm (EST). You never know who you might see in the stands! Go to http://www.cbssportsnetwork.com/tv-schedule/ and put in your zip code at the top right side to see what channel CBS Sports Network is on in your area. Northwest Ohio readers……beginner and novice help available at Toledo Pickleball Club! Thanks Joe! Maybe someday you and Andrea will go with me and Andrea and I can take on the world!! You did a great job of describing the event and site. I attended and thoroughly enjoyed it! I hope to compete next year!